Earn $46.20 in Rewards credit. Click to learn more. 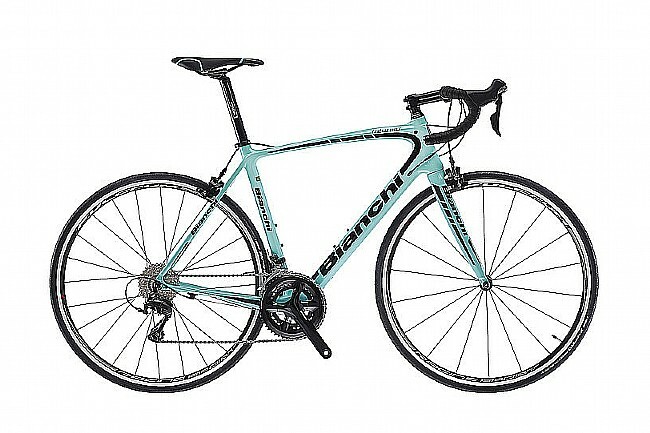 Bianchi’s 2018 Intenso 105 Road Bike is designed for unfettered endurance riding, featuring a monocoque carbon fiber frame and fork, a tapered steerer tube, longer wheelbase, and a slightly slackened head tube angle. The Intenso 105 has clearance for 28c tires, internal cable routing, and K-VID technology in the fork and seat stays for enhanced shock absorption and wheel stability. Fork: Bianchi Full Carbon w/Kevlar. Rear Derailleur: Shimano 105 11spd. Handlebar: Reparto Corse Compact Flat Top Alloy. Saddle: Selle San Marco Era Startup Power Open. Seatpost: Reparto Corse Alloy 31.6mm. Rims: Fulcrum Racing Sport, Aluminum; 24mm (front & rear height); 23mm (width). Spokes: Stainless steel, Rounded, J-Pull; 18 (front); 24 (rear). Tires: Vittoria Zaffiro Pro Slick 700x25c. Manufacturer Warranty: All frames & materials for 5 years. As delivered this is a great bike. With an upgrade to the wheels this is an awesome bike. I could not be more pleased with the way this Intenso handles and climbs.